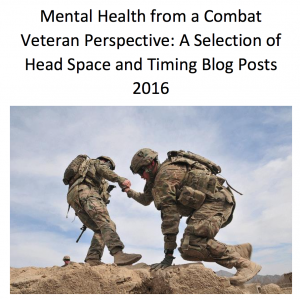 Whether you’ve been reading the Head Space and Timing blog for a while, or just recently joined us, hopefully you can tell that the goal here is to raise awareness about veteran mental health. To help veterans understand that there is nothing wrong, and everything right, with reaching out for help; to help spouses and family members understand more about what their loved one did go through and is going through; and to help community members, such as those who serve veterans and their employers, understand more about what it is like to be a veteran in today’s society. The response has been great. 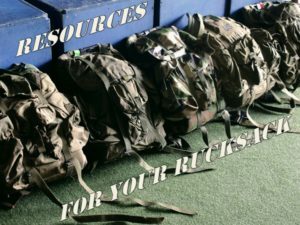 I’ve heard of veterans who have reached out for help after reading some posts, and having a short conversation with me. I’ve heard from parents who said, “I never talked to my son about this, and now we had a conversation.” I’ve had conversations with community leaders in several different industries who came to understand things just a little bit more. So if you haven’t signed up to receive updates, please do. This isn’t an email list, where we will be sending you newsletters or updates. It is our intent to never sell you anything or place ads on the site; this is completely free. Our goal is to help bring awareness to veteran mental health and have a place where we can discuss, openly and freely, the challenges and obstacles that we face. Out of appreciation, we would like to provide you with a downloadable copy of a collection of Head Space and Timing posts from 2016. If you got it from this link, you have our permission to share it with others, email it, print it out, use it for discussions, everything. The only thing we ask is that you don’t copy it and paste it somewhere else to pass it off as your own. Why steal something that is given freely? That’s not cool. Reach out to us. We’re not hard to find, and we haven’t said no to a request to post on another site yet. This video is from the El Paso County, Colorado Criminal Justice Center: the County Jail. This is taken in a jail ward that is set aside exclusively for veterans; every single one of the inmates you see in this video served their country at one point or another. The accumulated deployment time of the veterans in this ward probably approaches a century’s worth of combat. While there can be many discussions about personal choice and personal responsibility, this is a problem that happens way too often. In keeping with the idea that we can do much more than pushups for veteran suicide, these veterans are not just doing pushups at 1500 every day. They started a peer-led support group called Warriors First, which meets every day after doing the 22 pushup challenge. In this group, they talk about their experiences in the military, and what led them to make the choices they made. Several of these veterans approached us for articles to be read during the meeting, something that they could read out loud and discuss. As they don’t have access to the internet (of course) we were able to collect 52 articles in PDF format to provide to the ward deputies…who are also veterans, by the way…so that the veterans can continue to seek, think, and discuss veteran mental health. The response from these veterans, who have found themselves in a place in their lives that they never expected, has been nothing short of amazing. Their enthusiasm encouraged us to make this collection widely available. If they are reading, sharing and discussing the topics and information here, then perhaps you would to. You can also reach it by clicking this link: Head Space and Timing Blog Best of 2016. Feel free to download and share. The one resource? The downloadable collection of the post. The one reason? To have a discussion about veteran mental health with a veteran, which very well may save a life. Literally. And that would be worth every effort.